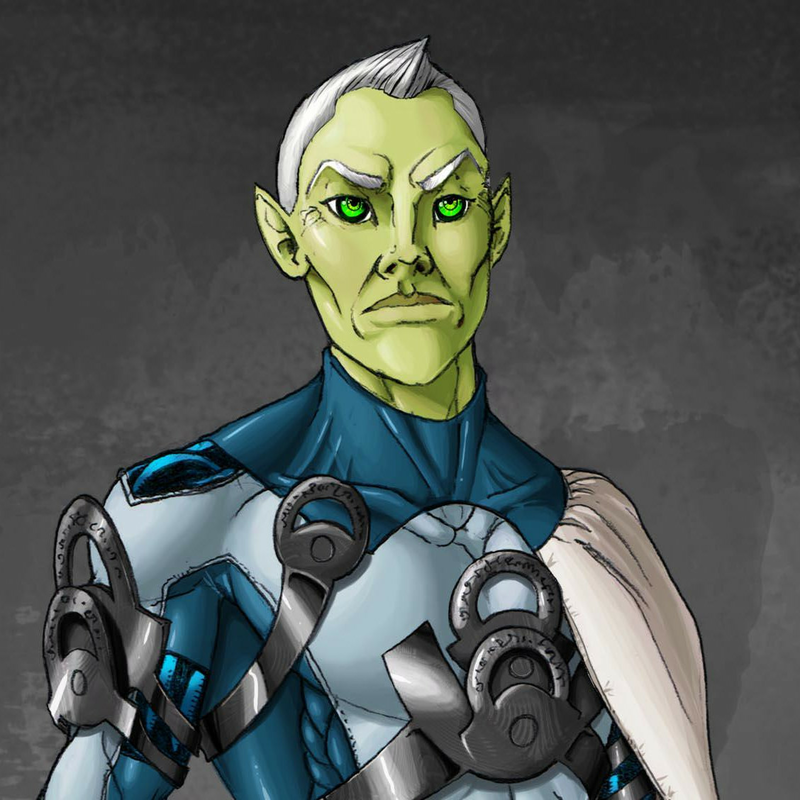 Legacy is an alien from the planet Eritos who was pulled from his life as a space scientist when a celestial convergence ripped him through a worm hole to Earth. Gaining genetic abilities from his time in the cosmic occurrence, he fell to Earth and was discovered by Ambrose Ghrayl. Legacy would become part of The 12 as the first hyper/super hero response force, and go on later to become leader of the Earth Savers and eventually start Valor. He is imbued with the ability to manifest and manipulate Gravity giving him a nearly limitless power set with diverse applications. Currently he works as the leader of Valor and self proclaimed protector of Earth. Due to his contact with the convergence tether that ripped him from Eritos and brought him to Earth, Legacy's body composition was changed augmenting him on a cellular level. His abilities stem from being able to manipulate gravity on a universal scale. What appears as super strength, flight, heightened reflexes and incredibly hard skin is actually his innate power to affect gravity. Later after the Uprising his powers evolved to the point he is now able to affect gravity as far away as Earth's moon. If he were ever to turn his powers to evil, he could single handedly manipulate the planet's gravity and crush every person with little more than a thought, or even draw the moon to collide with Earth and cause the destruction of the planet. Inhabiting all the finest qualities of mankind, though an alien, Legacy's ethic, mannerism, respect and professionalism are second to none. Slow to anger and nearly absent of any retribution, he was pacifistic if not for the betrayal of Ambrose Ghrayl. Set upon a path to correct the sins of his ignorance and naivety, he has since vowed to protect humanity from the whirlwind of supers and hypers created by his appearance on Earth. He is the rational voice in any team. A thoughtful, and sometimes soft-handed leader. He is passionately defensive of his duties and his teammates. Deep down inside he still feels like an Alien despite the welcome given him by all of Earth. Born Ahnad Ru Avi' icus of the planet Eritos in the Silvian Nebulos Galaxy (2.9B Light Years from Earth), Ahnad was a progressive technologist working as team leader on an orbiting space station around Eritos. His yearlong mission was to try and establish documented readings of a cosmic phenomenon that happened to strike Eritos every five thousand years. Accompanied by his sister Ahnna and a team of eight of the brightest minds from the planet, they detected and estimated the occurrence would happen sometime in the next year. A mere six hours later a great cosmic tether would cause total system failure and absolute destruction of the station. In an attempt to save recorded readings of the anomaly, Ahnad and his sister barely escaped the station's destruction being ejected in an escape pod; flung helplessly into space. The tether inevitably struck the pod and pulled it through a universal convergence. Acting as a stable worm hole, the tether rocketed the craft through space; all the while irradiating Ahnad and Ahnna with celestial energy and depositing them into Earth's atmosphere. As the ship crashed, Legacy was found by Ambrose Ghrayl; his sister was presumed dead. Legacy was helped back to health by Ghrayl and welcomed into Osiris Bio-Engineering's fold. Wanting to repay the generosity shown to him, Legacy offered up his altered alien genetic material to help Ghrayl cure diseases and heal disabled and injured humans. Legacy worked alongside Ghrayl for 14 years learning the nature of his new powers and acclimating to our civilization. After what had seemed a golden era, Legacy discovered too late that Ghrayl's own scientific curiosity led him to create a serum (Sequence 22) that would permanently grant humans hyper powers. Enraged, saddened and scorned by the abuse of power and betrayal, Legacy left without a fight. He quickly approached the U.S. Government allowing them to deal with Ghrayl and his tampering. Leading them to where Ghrayl's laboratory was, they found Osiris Bio-Engineering decimated and Ambrose Ghrayl presumably dead with all his research and the serum missing. Knowing ill things could happen if the serum fell into the wrong hands, Legacy joined Project Genesis spearheaded by the Department of Defense and The Gentleman to prepare the United States for any eventuality. For the next three years The 12 were created and consisted of the finest military personnel. They operated as an overwatch for hyper terrorists or any super threat needing precision solutions. Unfortunately during these three years, nothing ever happened. In 2047, a terrorist strike by China led to the death of nearly all of the 12 who were poorly prepared for a true fight with hyper powered villains. Legacy and The Gentleman then forged the second 12 which would go on to be called the Earth Savers. Legacy was instrumental in the cessation of the Cold War in 2048, as well as the formation of Valor in 2062, The Intergalactic War and arrival of other aliens in 2075 and the disarmament of nuclear weapons averting a global disaster in 2089 during the Uprising. Unable to prevent the deceptive death of Glimmer or the destruction of San Diego, Legacy became withdrawn, internalizing personal losses more and more as he watched hero after hero perish in the last 60 years. He is still a bastion of good and justice and works relentlessly, almost obsessively, to preserve order on Earth. While technology and conflicts from past decades have defined a more prosperous world, he is none-the-less overly committed to stand watch and save as many innocents as he can.